Have you ever had brown butter? I made a brown butter frosting here, and it was the best thing I have ever had. I couldn’t get enough of it! 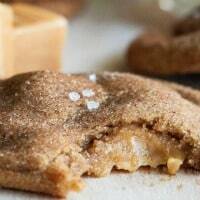 Salted brown butter cookies with amazing flavor and perfect chewiness, with a surprise caramel inside! To brown the butter, heat a medium saucepan to medium high heat. Add the sliced butter, whisking frequently. You will notice the butter starting to become frothy on the top and brown specks will start to form along the bottom. You have to watch it closely because the turn happens quickly and you don't want it to burn. You will start to smell a nutty aroma and once it turns to a brown color, remove from heat and let it cool to room temperature. While the butter is cooling, cut the carmel squares into ¼'s. Once you are ready to bake preheat the oven to 350 degrees. Measure about 2 tablespoons of dough and roll into a ball. Flatten the ball and place 1-2 caramel squares inside, wrap the cookie dough over the caramel and roll back into a ball. Make sure it is completely covered so that the caramel won't stick to the pan. These were sooo yummy! I had to have my husband hide them from me so I wouldn’t eat them all! I was looking for a dessert to bring to a weekend ski trip with friends and this is it! At first I had some trouble with the caramel part ‘falling out’ of the cookie while cooling – I first tried to cool on a plate and then when I went to move it the sticky caramel stuck to the plate while I tried to lift the cookie. I then tried to cool the cookies on a cooking rack and the caramel piece just fell right through. I finally figured out that turning the cookies upside down to cool on the rack worked perfectly. I will definitely be making these again! I just printed this recipe . . . 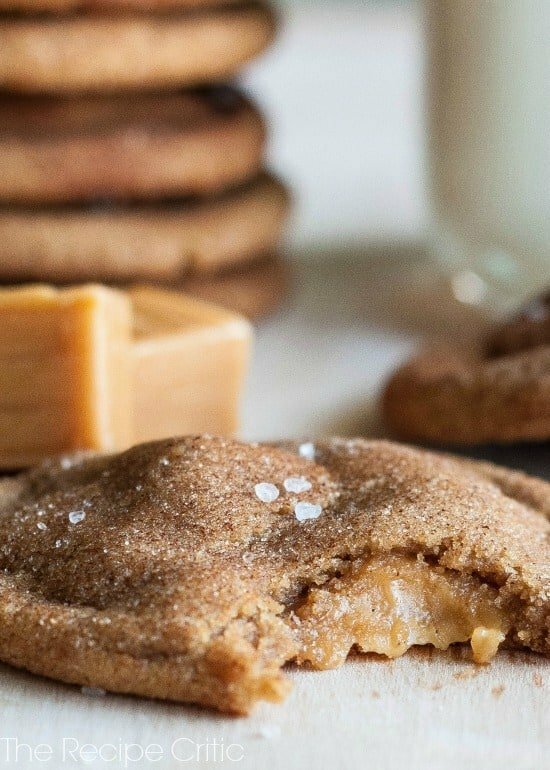 I am a sucker for anything Snickerdoodle-ish or caramel-ish! Also, could you tell me what the font name is which, you used for the word “Snickerdoodle”? It is a wonderfully clean font . . . I do love the way you mix fonts for your recipe titles!!! I just added my name to your feed listing and look forward to finding more great recipes, Alyssa!! So I wanted to comment that I made these last night as my cousin had requested them awhile back. The cookies came out AMAZING! Except for one thing!…. They were completely flat. I read that this could be the fact that I didn’t let my dough refrigerate over night. Also, another baker (on another website) mentioned that she cooks hers at 375 to avoid over spreading. I am going to attempt these two things and see if that helps any. I will report back after the weekend! I did want to mention that I added sea salt on top and that was probably my favorite part of the cookie! Thank you for a great recipe! Oh my gosh, me too. They taste incredible, but I even put my dough in the fridge overnight and they still flattened too much. Any suggestions? First off, these cookies are amazing! Even when cool they are still thick & chewy. The caramel in mine seemed to have baked into the cookie however. The flavor is still there but not the gooey caramel center I was hoping for. I used the Kraft caramel bits & put 5 in each cookie as suggested by others & my batch yielded 30 cookies so pretty close to what the recipe said. I didn’t over bake them so am confused as to where I went wrong. Any suggestions would be appreciated! Thx! These are so-o-o-o-o-o yummy! I used Kraft Caramel Bit and flattened the cookie dough balls after rolling them in cinnamon-sugar and before topping with sea salt. Otherwise, I followed the recipe as written. The instructions to make browned butter were quite good. Oh no! I hate when things don’t turn out. You may have cooked the brown butter to long because the dough should taste amazing. It tastes just like regular cookie dough with an added nuttiness from the brown butter. When cooking the brown butter it should start to froth and then as soon as it turns brown remove it from the stove. My family DEVOURED these. They’re so delicious. Thanks for the recipe! what is cream of tartar??????????????????????? So I am not going to lie…these were a labor of love…not you average throw your cookie batter together and in the oven they go. These take time and preparation…but I promise they are worth it! Heaven in a cookie! The browned butter made all the difference…mmmm! They won’t be a cookie I make all the time, but they will probably be more of a special occasion cookie. Definitely worth the effort! If you wanted to skip the caramel step you could. They have amazing flavor even without the caramel. But it is a fun little treat in the middle. I made these, following the recipe exactly, and they were delicious! The recipe states it makes 24 cookies, and at that quantity they are quite large (~3.5″ diameter) but this size is necessary to accommodate the caramel inside. As much as I enjoyed the caramel, next time I make this recipe I’ll probably leave it out. It added multiple steps to the process (buying caramels, unwrapping & cutting, adding to dough) and then for some cookies, made a mess when caramel leaked out of the cookie and all over the cooling rack. Then, when the cookies are cool, the caramel hardens up a bit and isn’t as nice as when they were warm from the oven. I used Werther’s Original (soft, not hard), and cutting them in half was the right size for the cookie. This recipe is simply amazing even without the caramels, so add them if you want, but don’t stress if you don’t have any. If you leave the caramels out, you could make smaller cookies and get perhaps 36 or 48 out of this recipe. Just adjust the cooking time so they smaller cookies don’t overbake. Even though I would leave the caramel out next time, I’d still add a little course salt to the top of each cookie – that was amazing too! Let me start off by saying, I’m not a snickerdoodle fan. If I were standing in front of a buffet of cookies, a snickerdoodle would be one of my last choices. 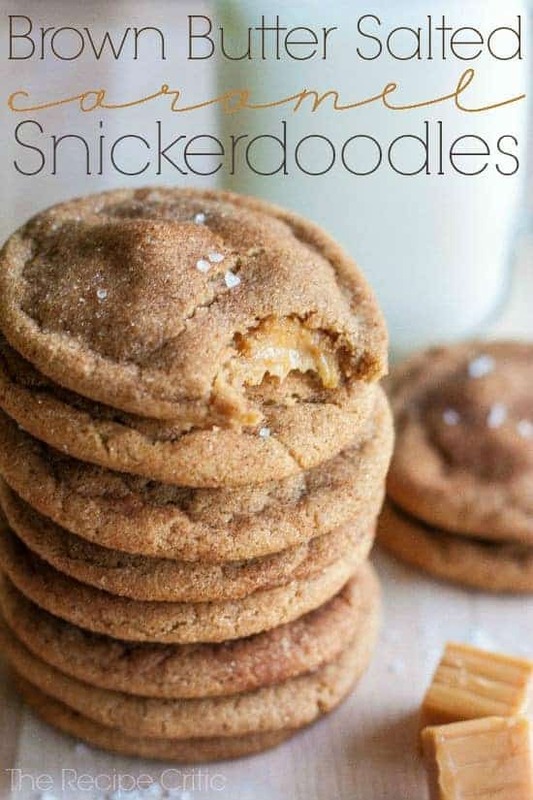 That being said… THESE snickerdoodles have an AMAZING flavor! I loved them! 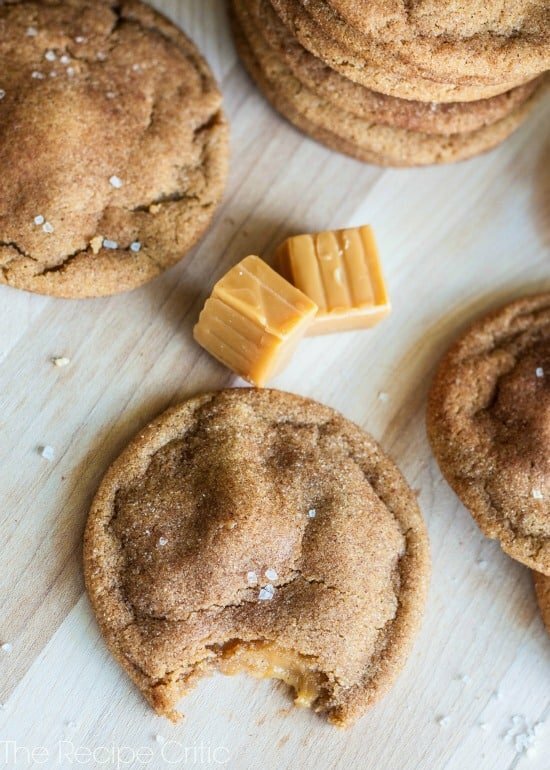 Brown butter adds awesome flavor, there’s no denying it. I used soft Lancaster caramels. I cut each caramel in 1/4’s and added 3 pieces. The recipe says to chill the dough for at least 30 minutes, which I did the minimum chill time, and I felt the cookies spread way too much. I definitely think they need to chill longer than 30 minutes. After baking up most of the cookies, I thought of putting the last few rolled balls into the freezer for 15 minutes, and they were quite firm, and baked a little thicker than the others. Also, don’t make the mistake I made with my first batch of browned butter. I allowed the butter to sit in the hot pan (once it was taken off the heat), and when I went back to check on it after it had cooled, those brown bits had turned much darker. SO, I tossed it, and started again. To be on the safe side the second time, I poured the browned butter into a different bowl, so the hot pan wouldn’t keep cooking the milk solids. Also, I put the butter in the fridge to cool. It probably took 30-45 minutes to get to room temp. BTW, I brought these cookies to my class that I teach at church. The kids in my class are 10-year-olds. I brought 4 kinds of cookies, and I always love getting feedback on my food, so I asked all the kids which cookie was their favorite, and I was surprised that almost all of them said these snickerdoodles. These are definitely a keeper. Also, these cookies sat out on my counter-top for 3 days, and they were still soft. As I have my dough chilling…. Reading over the recipe I notice the 1/2 teaspoon of sea salt, I did not see where to put it in…. The dough tasted yummy though… I will sprinkle the tops with some but I am missing where to put in the 1/2 teaspoon. Hopefully they will still turn out.. I chilled my dough for several hours and it’s hard as a rock. I can’t do anything with it now. Not sure what went wrong. So delicious!! I used caramel bits instead of the squares thinking it would reduce step of cutting caramels and it worked but not very caramel-y results so next time i’ll try it with the squares. nonetheless these are so amazing and will definitely be making over and over again! Thx for sharing!!! I have made this recipe over an dover again for the past several years. I did have to make adjustments to make the recipe dairy free, like making homemade caramel that doesn’t have milk or butter, and instead of greek yogurt I use dairy free yogurt. This is the most requested dessert by my 3 boys and Husband. Thank you for sharing. I am in the process of doing my blog for my dairy free recipe and will give your page the credit for original recipe. Thank you for posting this recipe. I made these cookies tonight and I can say with 100% honesty, this is the most delicios cookie I have ever tasted. Mine turned out a bit flat. I’m wondering if I didn’t let the butter cool enough before I mixed the batter up?? Still, the flavor was outrageously addictive. I don’t think I will ever bake another cookie before browning the butter first. So good. These cookies were delicious!! I made these for a Christmas cookie exchange and they were a gigantic hit. I used green sugar to roll them in (along with cinnamon) and they were very festive. I made a double batch, and using my medium cookie scooper got 5 dozen cookies out. People are already asking for them again! These cookies are excellent. I’ve made them three times in three weeks and I know I will bake them many more times in the future. Thank you for sharing the recipe. One comment though: I often rely on a recipe’s listed “prep time, cook time, total time” when making decisions about what to make and when. This recipe states that it takes 30 minutes of prep time and 8 minutes baking time, for a total time of 38 minutes. But if you follow the recipe and refrigerate the dough, these cookies take at least an hour and 8 minutes to make (and, in my experience, actually quite a bit longer than that). I’m not complaining about how long it takes, just that the listed time is not accurate.